It looks like Chromebooks are becoming the popular choice for the education sector, with a new report indicating that sales for Windows-based devices and Apple devices in the school sector are beginning to fall behind. During the first half of this year, about 2.4 million Chromebooks have been shipped to schools in the US, senior IDC research analyst Rajani Singh told the New York Times. In comparison, only 2.2 million Windows-based desktops and notebook computers have been shipped this year so far. While the difference isn't significant just yet, it does show a significant growth for Chromebook devices, as during 2014, 4.9 million Windows devices, including notebooks and desktops, were shipped to US schools, while only 3.9 million Chromebooks were shipped in the same period. Though we don't have a number of how many Apple devices have been shipped to the education sector so far this year, IDC believes that Chromebooks will catch up to Apple devices as well. "Even if Microsoft is No. 1 in volume and Apple is No. 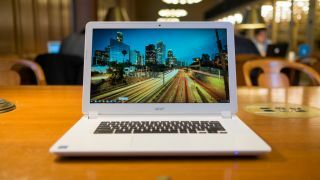 1 in revenue, from the growth perspective, nobody can beat Chromebook," Rajani told the publication. For comparison's sake, according to IDC, Apple shipped about 4.2 million devices in 2014, including Macs, MacBooks and iPads. But while it looks as though Chromebooks will take the lead in the school sector this year, it should be noted that Windows 10 has only just been released and Apple is expected to release new iPads later this year. It is possible that the numbers could be swayed against Chromebooks, and with the new school year starting across the US, we'll have to wait and see the final numbers in the end of the year.